CATHOLIC GIFT SHOP LTD - Missionary Corded Rosary St Teresa of Calcutta (Mother Teresa). Missionary Corded Rosary St Teresa of Calcutta (Mother Teresa). 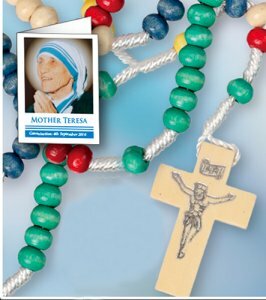 Mother Teresa corded Missionary rosary beads with Mother Teresa rosary prayer card. Bead: 4 x 6 mm diameter.